It doesn't matter if the water gets spilled outside. To some puppies, the water bowl looks like a fantastic toy, ideal for tipping over and flinging around. Cute as this may be, your kitchen probably doesn’t benefit from a constant supply of puddles, not to mention that you’ll have to keep refilling the dish. Place some old newspapers under the bowl to start with. This deals with the first problem -- puddles. Provide a selection of other toys for him to play with, preferably not of the same material as the water dish. Spend as much time as you can playing with him and these more appropriate toys every day. Watch your puppy closely every time he goes for a drink, if possible. Clap your hands or make another loud noise to distract him the second he puts a paw in the bowl or makes a move to pick it up. Call him away once he has finished drinking. He won’t play with the bowl if he isn’t near it. Replace the bowl with a heavy ceramic one, which is a lot harder to tip over and almost impossible to pick up. Install a dog dish stand, homemade or from a pet store. This keeps the dish at head height, making it difficult to play in. Wash his water bowl daily using dishwashing liquid and rinse thoroughly. A dirty bowl is a health hazard. He may also try to tip it over just to get fresh water. If your puppy loves playing in water, consider getting him a paddling pool as a vastly better alternative to the water dish. Cheap children’s paddling pools are available second hand, in local advertising or at garage sales. Fill it up in your yard and let him play to his heart’s content. Drain it after each use -- you can use the water for plants -- to prevent it becoming filled with algae and mosquito larvae. If he is spilling water in his crate, try using a large rabbit drinking bottle. Once he’s learned to drink from this, you can remove the dish. Use two or more bottles for a large dog. Alternatively, buy a dish and clamp combination that attaches to the side. Never place items such as rocks in the water bowl to weigh it down. Your dog could swallow small ones or break his teeth on large ones. 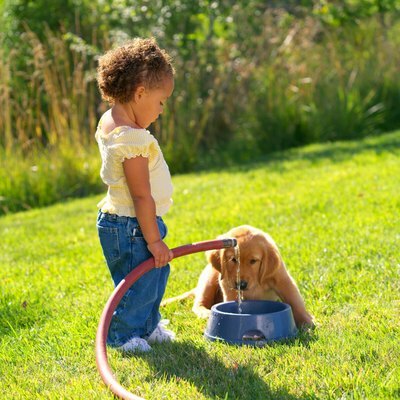 Vet Street: Why Does My Dog…Dig in Her Water Bowl? What Kind of Water Dish for a Cat Who Paws at Water?